In light of some high-profile automobile accidents involving older drivers Massachusetts has begun the policy discussion regarding enforcing more stringent licensing requirements for those individuals. State legislators and DOT officials are contemplating a range of requirements to protect the elderly as well as other drivers and pedestrians. I support measures that require older drivers (i.e. drivers over 65 or 75) to renew licenses more frequently than other drivers and ensure that the renewal involves a driving test and vision test. This is not age-based discrimination, but rather steps necessary to protect all people on the road. However, such restrictions which may limit and indeed deny many older individuals access to the driver’s wheel need to be coupled with increased access to public transportation and paratransit services. While not all elderly individuals are disabled, age significantly affects the ability of people to drive, forcing them to rely on means of public transportation. Cognitive and physical abilities decline as people age, and elderly drivers are the drivers most likely to be in a crash except those under 25. The aging of the body affects drivers in many ways: declining vision affects the ability to judge distance and speed, metabolism changes slow reaction times, and withering muscle mass increases the difficulty of making rapid movements like sudden braking. 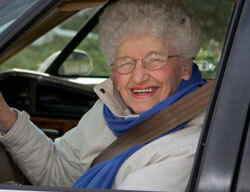 Elderly drivers are also more likely to be injured in a car crash than other drivers. More to the point, older drivers are more likely than younger drivers to be killed in car crashes relative to miles traveled; drivers 85 and older have a fatality rate in crashes nine times higher than drivers 25 to 69 for each mile driven. Many states are taking proactive measures to protect the elderly and other passengers and pedestrians by requiring older drivers to renew their drivers’ licenses. Illinois and New Hampshire already require drivers over 75 applying to renew their drivers’ licenses to take a driving test and a vision test. While New Hampshire and Illinois have the most restrictive regulations, other state have taken precautions, such as Iowa, which requires drivers over 70 to renew their licenses every two years in person with a vision test, rather than every five years for younger drivers. Elderly Americans without cars are severely restricted in their ability to be active members of society. Regardless of the reasons why elderly people do not drive, for the 21% of Americans over 65 who do not experience 15% fewer trips to the doctor, 59% fewer shopping trips and outings to restaurants and 65% fewer trips for social, family and religious activities than their driving peers. These issues are already becoming particularly pressing in certain areas of the country, such as Florida where 19.6% of the driving population is over 65 and older; the national average is 14.9% of the driving population is 65 and older. Some states, such as Arkansas, where drivers over 65 account for 29% of all accidents, may be compelled to deal with these issues sooner than later. There is also an ethnic justice component to the need for improved public transportation for the elderly, because minorities are disproportionately affected by the lack of transit options. In the population of Americans over 65 just 16% of white people do not drive, but 42% of African Americans, 39% of Latinos and 45% of Asian Americans do not drive. Unfortunately, all the transportation safety news tends to focus on airlines, especially given the attempted terrorist detonation last week. However, America’s roads are still the most deadly form of transportation. The elderly desire, deserve and need transportation as much as anyone else, but not at the expense of others’ safety. As the baby boomers age and the elderly population grows (The United States Census Bureau estimates that in 2010 there will be 5,751,000 people over 85 and by 2050 there will be 19,041,000 people over 85, accounting for 4.3% of the projected overall American population of 439 million.) the needs of this population will only become more apparent. We need to develop alternative means that are coherent with general transportation, especially public transportation, priorities. Or else our grandparents and us will all be in unnecessary danger every day.